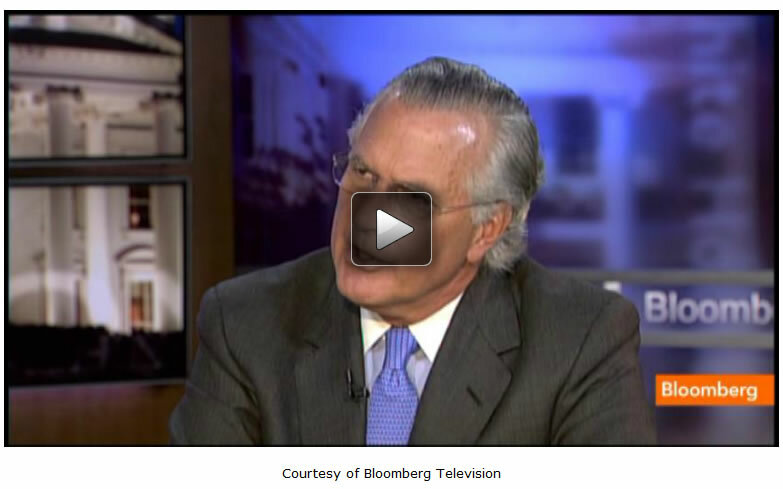 Dallas Federal Reserve president Richard Fisher told Bloomberg Television's Michael McKee today that the one thing everyone at the Fed agrees on is that "we don't want inflation to raise its ugly head." Fisher said that "as perhaps the most hawkish member of the Fed when it comes to inflation," he doesn't "see that prospect right now." Fisher also said that community and regional banks need a "level playing field" and that "I do not dislike Jamie Dimon or Lloyd Blankfein. My children are friends with Lloyd Blankfein's children. They're good people. They do a good job at what they do. They're not bad people. It is just that the system is biased towards their institutions." "This is just the Dallas Fed view. I'm not speaking for anyone else in the Federal Reserve system. Our view is that it's a simple matter. We have this hyper complex legislation--Dodd-Frank--that penalizes the small and medium sized banks. In fact it penalized by our calculation 99.8% of banks in the country. It is really designed to contain too big to fail. There are about 12 institutions that might fit into that country, so 0.2% of the number of banks in the country with over 60% of assets in the system. Our proposal is simple. We would have both the depository insurance and Federal Reserve discount window available only to the commercial banking side of a large complex bank holding company. And not to the special investment vehicles or anything else that might be hidden in those banks, but just to provide the taxpayer a guarantee that we do and accept as a society to protect our depositors." "That's correct. The counterparties in all of those trades would sign a simple document, a paragraph long--saying that I, whatever the company is, understand there is no insurance protecting me in this transaction. That this transaction is entirely a risk." "It's not just my argument. I think this is fairly well documented and it is also common sense...Andrew Haldane from the Bank of England has done a lot of work on this in terms of the subsidy that you get, if you are considered systemically important or too big to fail, it is between--let's say 100 basis points--you certainly get a better credit notch with the rating agencies if you are considered unfailable. It penalizes the small and medium sized banks in terms of the cost of funding. They will submit that and we see it in terms of our calculation. Even the Bank of England has done work and the BIS--very important bank for international settlements--has noticed that they have better credit ratings and a better subsidized funding structure on the assumption they are unlikely to fail. As long as that assumption is in there and there is this enormous complexity that burdens the small and regional banks and incidentally, 99% of the banks in this country, particularly the small community banks, we know the FDIC can go in--in by Friday out by Monday. They do close and they do fail and then they are restored under new ownership. The regional banks take a little longer than that, but that's also doable. It just doesn't apply to the small group of 0.2% of the banks." "All we are suggesting at the Dallas Fed is that we level playing field so the community and regional banks are not placed at a disadvantage to those that are assumed to be too big to fail. For all its good intentions, Dodd-Frank does not solve the problem. And there's more concentration in the banking industry than there was before." "I do not dislike Jamie Dimon or Lloyd Blankfein. My children are friends with Lloyd Blankfein's children. They're good people. They do a good job at what they do. They're not bad people. It is just that the system is biased towards their institutions. It places others at a disadvantage. I want to level the playing field. The market will decide, and they will decide themselves if they do not have an explicit or implicit guarantee. The markets will decide where the value of those franchises are. We have seen some discounts to book value with some of them. They've gotten closer to trading at one to book value. Those that are less complicated have done even better recently as we've had a run-up in bank stocks. I'm pretty sure the market would take care of it. I'd rather have as little government intervention as possible if we had simple, straightforward rules." "This is my own personal view...I would not have been in favor of our recent initiative. I think there is plenty of liquidity out there. American businesses are as fit as they have ever been. Their balance sheets--thanks to the Federal Reserve--are an awfully good shape. The cost of capital is the lowest in the history of the United States. I do not think we need to do more. Secondly, I wasn't in favor of having that employment benchmark. But, I'm part of a team. The team made a decision. We go forward and we must now reassess our sense of the efficacy of how this is working and that's what I believe the committee will do." "That's a committee decision. We have recently announced this new program. I do not think it is infinite. I've heard the term QE infinity. Let's give all of the Federal Reserve some credit, whether it's me or my colleagues who are constantly assessing and reassessing the situation to see what is needed. We may have differences of opinion about what is needed, but the road does not go on forever. I cannot give you a specific time frame. That depends on the conditions in the economy." "It does [worry me]...I want to make sure you understand when I say I worry about it. It just means its something that we need to constantly analyze...The one scenario all of us--and here I think I can speak for all of my colleagues--we do not want to see inflation raise its ugly head. I am perhaps the most hawkish member of the committee. I do not see that prospect right now. The real issue efficacy of how it impacts what is mandated to us by Congress, which is on job creation." Copyright © 2013 Bloomberg - All Rights Reserved Disclaimer: The above is a matter of opinion provided for general information purposes only and is not intended as investment advice. Information and analysis above are derived from sources and utilising methods believed to be reliable, but we cannot accept responsibility for any losses you may incur as a result of this analysis. Individuals should consult with their personal financial advisors.